Molnlycke Mepilex Border Self-Adherent Foam Dressing is an all-in-one foam dressing. It is designed to absorb and hold exudate, creating a moist wound healing environment. Mepilex dressing helps in reducing pain and trauma at the wound site and surrounding skin. How to use Mepilex Border Foam Dressing? How Mepilex Border Self-Adherent Dressing work? Backing Film: Viral proof, bacteria proof and shower-proof film. High breathability and permeability allow for effective vapor transmission. Retention Layer: Retains moisture and keeps it away from the skin to reduce the risk of maceration. Spreading Layer: Distributes the exudate evenly into the retention layer. Absorption Layer: Absorbent foam pad provides quick and effective absorption. Provides enhanced moisture control. Safetac Wound Contact Layer: Located nearest to the skin. Helps reduce pain to patients during dressing changes. Does not stick to the moist wound bed, but only to the surrounding dry skin. Seals the wound margins and reduces the risk of maceration. When to use Mepilex Border Dressing? Gently cleanse the wound, dry surrounding skin. Mepilex foam dressing size should overlap the wound area by at least 2 cm. Apply dressing with the adherent side to the wound. 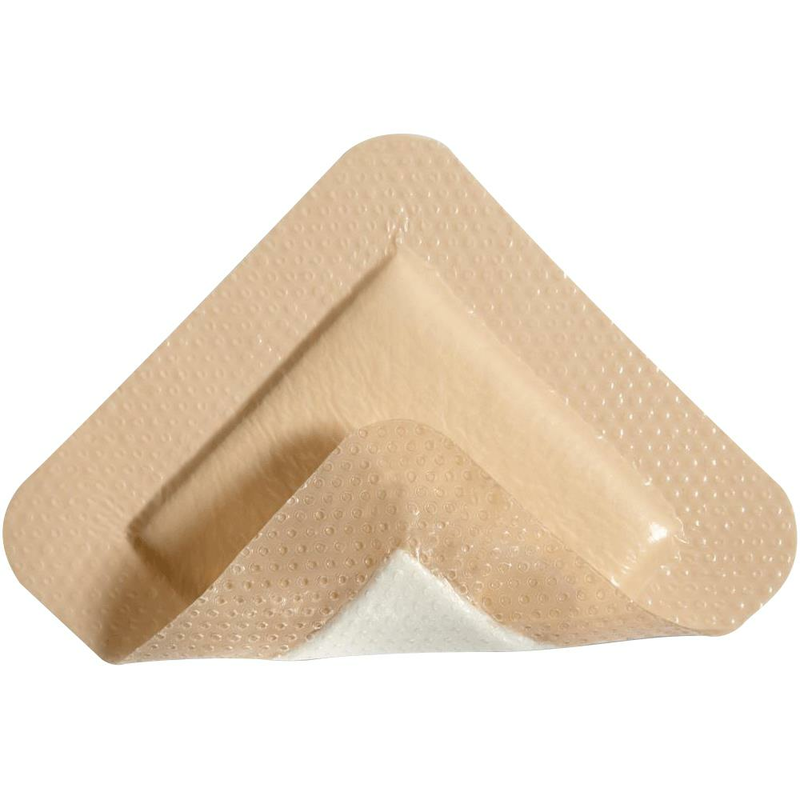 When used on an extremity, position Mepilex Border bandages slightly below the center of the wound to avoid leakage caused by gravitation. If needed, fix Molnlycke Mepilex Border dressing with Mepitac tape, secondary fixation product like Tubifast or compression bandage. Apply extra fixation only around the margins of the dressing. Consult a health care professional for adequate treatment in case of clinical infection. Do not use Mepilex Border with oxidizing agents such as hypochlorite solutions or hydrogen peroxide. Store the dressing in dry conditions below 35 degrees C.
Protect the dressing from direct sunlight. Mepilex Bordered Foam Dressing can be used on clinical infection if appropriate antimicrobial therapy is used. Initially, sloughy wounds may appear to increase in size due to moist conditions produced beneath the dressing. It is normal to expect an increase in size at first. Interval between changes will be determined by the amount of exudate produced by the wound. The dressing may be left in place for up to 7 days depending on the wound condition. Safetac is a patented soft silicone adhesive technology. Mepilex Border Safetac technology cause minimal tissue injury during wear and upon removal. It minimizes wound and surrounding skin trauma, which reduces patient pain. 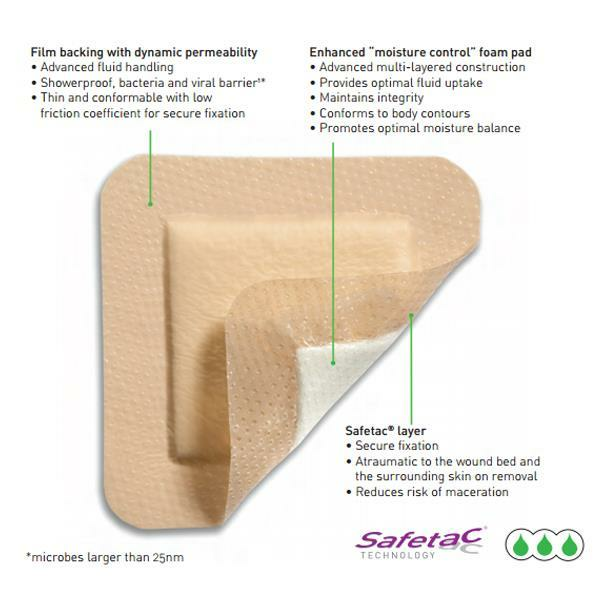 Safetac layer seals the wound edges and prevents the exudate from leaking out. This minimizes the risk for maceration. Faster Healing: Mepilex Border with Safetac technology creates a faster wound healing environment. Traditional adhesives may strip the skin, tear the wound and leak drainage back onto the skin. All these things delay wound healing. Safetac layer does not stick to the wound and does not strip the skin. Mepilex Border with Safetac technology absorbs drainage better than other dressings. Along with longer wear time, it provides an optimal moisture and temperature. It results in undisturbed wound healing. Less Pain, Less Stress: Pain from dressing changes is often a result of adhesives damaging the wound and skin. Pain causes stress, and stress delays healing. Molnlycke Mepilex Border foam dressing is designed to be less painful during dressing changes. Comfortable: It is soft, comfortable and easy to use on difficult to dress wounds. Soft silicone Safetac layer does not stick to wound on removal, giving less pain to the patient. Less Trauma: No skin stripping and wound bed adherence. Mepilex Border Self-Adherent Foam Dressing does not damage the newly formed granulation tissue. Unique Sealing Action: Safetac soft silicone adhesive seals the wound margins, protecting against exudate leakage and maceration. Seals completely and instantly, easy to apply and re-apply if needed. Supports optimal moist wound healing conditions. Can I take a shower with it on? If so, does it need to be replaced with a new one after showering? Mepilex Border Self-Adherent Foam Dressing is shower proof and you do not need to replace it with a new one after showering. What is the pad size of the 4"x4"? 4" x 4" Mepilex Border Foam Dressing has 2-1/2" x 2-1/2" wound pad. 5 Mepilex Border Foam Bandages come in a Pack and 50 bandages in Case. Thank you for reaching out to us. All sizes are packaged differently. The PKG option on product page shows the packaging of options. for eg. The 3" x 3" (7.5cm x 7.5cm) comes in Each (1), 5/Pack (5) and 5/Pack, 14Pk/Case (70). 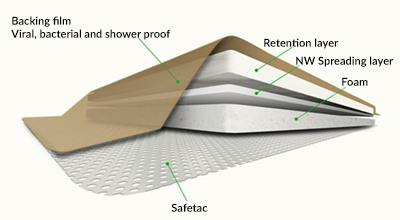 Yes, Mepilex Border Self-Adherent Foam Dressing is waterproof. What is the frequency of change? Mepilex Border Wound Dressing can remain in place for up to 7 days depending on drainage and wound condition. Open the package by pulling. Apply the adherent side to the wound. Do not stretch. 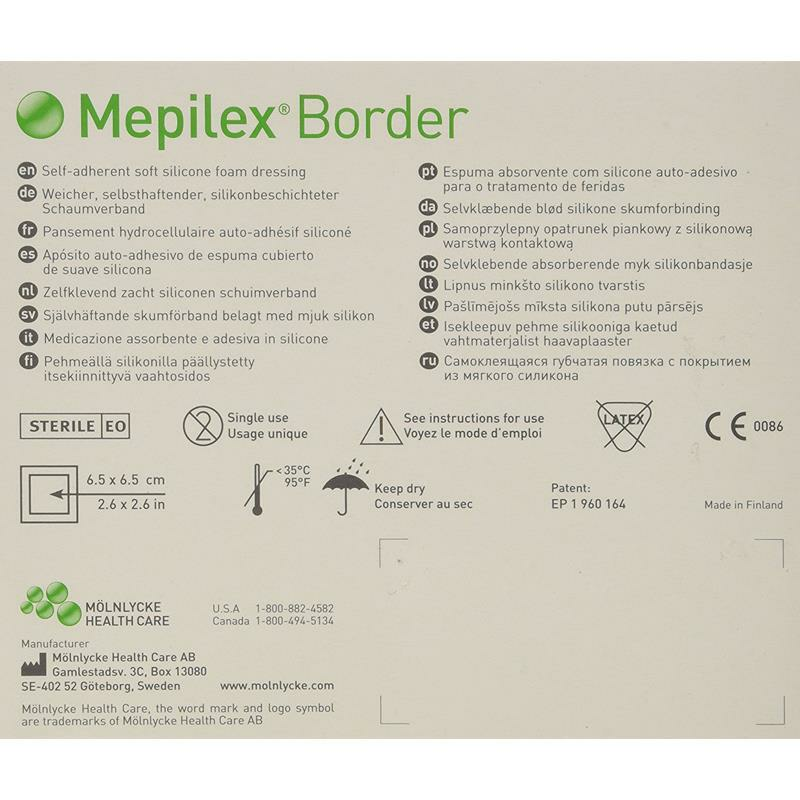 Mepilex Border Self-Adherent Foam Dressing is designed for a wide range of moderate to highly exuding wounds such as pressure ulcers, leg and foot ulcers and traumatic wounds (e.g., skin tears, road rash and minor injuries).